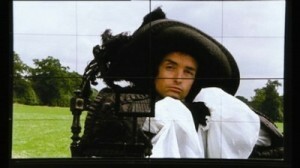 Set in the 17th Century, The Draughtsman’s Contact focuses on the contract between Mr Neville (Anthony Higgins) and Mrs Herbert (Janet Suzman) to paint a picture of her husband’s estate. As part of Neville’s preparation for his masterpiece, he dresses the house with sculptures and then instructs the household not to move any objects. But when the statues in the house suddenly start to move about and even shift shape, the very particular Mr Neville becomes increasingly upset. The plot is further complicated when Mr Herbert (Dave Hill) is found dead and it is discovered that Mr Neville’s paintings inescapably point towards his having been murdered. The (mis-en-)scene is set for mystery, intrigue and blackmail. Although the film alludes to the Herbert house being located in Wiltshire, The Draughtman’s Contract was actually filmed at Groombridge Place near Tunbridge Wells. One of the formal gardens at Groombridge used in the film has been renamed in commemoration of the filming: The Draughtman’s Lawn boasts beautiful primroses in the spring and striking ornamental trees in the summer. Groombridge Place Gardens and Enchanted Forest is open from spring until early November but the house itself is not open to the public. It has previously been used as a film location by Pride and Prejudice (2005). The Draughtsmans Contract was released in cinemas in 1982 and is now available to buy on DVD. This entry was posted in Filmed in Kent and tagged feature film, Groombridge Place, The Draughtsmans Contract film locations. Bookmark the permalink.